Stems slender, smooth, arching, often zigzag above from a thick, horizontal, jointed rootstock, bearing the raised orbicular scars of the stems of former years; stem naked below, above bearing six to many opposite or nearly opposite, oval or ovate leaves, 2 to 4 inches long, one-half to 2 inches wide, acute or acuminate at the apex, narrowed or obtuse at the base, pale or pubescent beneath, glabrous above, the upper leaves commonly narrower than the lower; flowers in drooping, axillary clusters of one to four (often two), perianth greenish or greenish yellow, tubular, one-third to one-half of an inch long, with six short lobes; the six stamens shorter than the tube, their anthers sagittate and filaments minutely roughened. Fruit a dark blue, pulpy berry about one-fourth of an inch in diameter. A common but not showy plant of woods and thickets from New Brunswick to Ontario and Michigan, south to Florida and Tennessee. 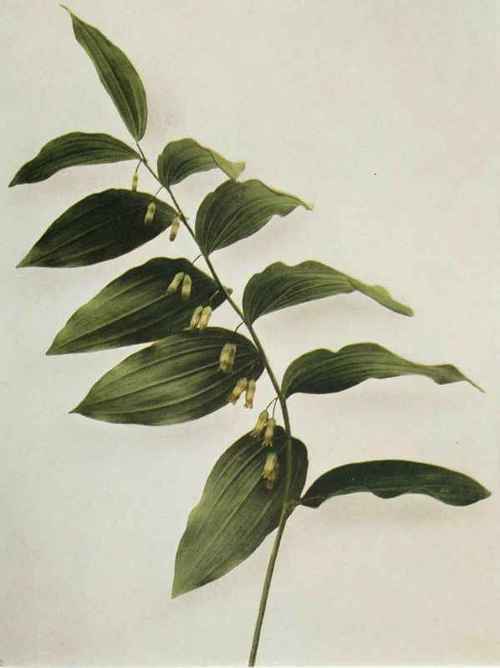 Resembling this but usually larger in every way, with glabrous leaves and smooth filaments, is the Smooth or Giant Solomon's-seal (Polygonatum commutatum (Roemer & Schultes) Dietrich), which ranges northeastward only to Rhode Island, New Hampshire and Ontario. It seems to prefer moist thickets and woods along streams and on bottomlands, while the Hairy Solomon's-seal is more commonly met with in rich upland woods.